Does AminoLast Work to Build Muscle? Those who undertake the pursuit of achieving the ultimate body set out on a journey that is fraught with many challenges. Not only must they choose the best possible training techniques and stick to them religiously they must also take great care in being sure that they keep a proper recovery period schedule and a dietary plan that provides them with all the necessary elements needed to reach their goal with nothing that will slow their ascent. Another and equally important aspect of any top notch regimen must include the highest quality supplements that offer the highest levels of support for everything else that a serious athlete needs. This includes the need for the most crucial sources of energy, endurance, help with speeding up and maximizing their recovery periods and the ability to burn fat at the most efficient rate. The most accepted way to achieve this goal is to use a supplement loaded with BCAAs which provide the user with the highest and most efficient list of crucial amino acids that boost the connected systems. The real problem facing the serious bodybuilder and other athletes is that the market for these types of supplements has been expanding at an ever increasing rate as more and more companies jump in and try to capture their share of this multi-billion dollar health and fitness supplement industry. One of the key reasons that the process of choosing the best products is simply that most of these products tend to have very similar ingredients and extremely similar claims. But, unfortunately, as the most experienced bodybuilders know, it is not the ingredients that necessarily make a great product, it's the way these ingredients are formulated that have the greatest effect on how much benefit can be gained from them. Keeping all this in mind, we, as part of our concerted efforts to help our readers find the products that will work best for them, have decided to take a long hard look at one of the most talked about bodybuilding supplements available today - it's called AminoLast. A product of Gaspari Nutrition, AminoLast is a bodybuilding supplement designed to speed recovery, reduce soreness, provide ten grams of potent amino acids and the maximum amount of electrolytes. 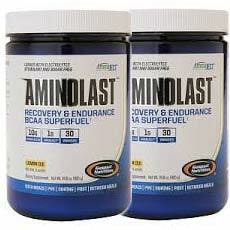 The list of ingredients found in AminoLast consist solely of BCAAs including L-leucine, L-isoleucine, L-valine, L-taurine, L-ornithine, L-aspartate. These critical elements in their base form are generally recognized as being everything one would need to achieve the needed energy, endurance, increased recovery times and fat burning capabilities required for massive gains. As we alluded to earlier, the ingredients found in any supplement has a certain level of importance but it is the way in which the ingredients are formulated that makes all the difference when it comes to the supplements overall effectiveness. Clearly, there is ample evidence that the individual ingredients used in AminoLast have a track record which are well-established with a large volume of scientific evidence to support their benefits. Unfortunately, a standard search for any research, clinical studies or trials on the actual formulation behind AminoLast did not turn up any such evidence that would support the claims made by the producers of the product. Most products including health supplements generally post a number of testimonials or user reviews on the official websites or secondary resellers such as online retail outlets like Amazon.com. In the case of AminoLast there is no official website that we could find to see what testimonials that they might offer. Regardless of this lack of officially sanctioned testimonials it is our policy to seek out less biased sources of testimonials and user reviews. Looking widely at a number of industry related websites with no apparent affiliation to AminoLast or Gaspari Nutrition and an array of chat rooms discussing the subject of bodybuilding supplements we discovered a significant amount of independent user reviews. Taking them in total it is clear that the vast majority of them held highly negative views of their experience with AminoLast. A closer look reveals that the main theme of these negative reviews was that AminoLast simply did not live up to its claims. As with any supplement designed to have an effect on various body functions and chemical processes there is always the possibility of significant side effects, allergic reactions or other potential health issues. As always, it is advisable to seek a consultation with a primary care physician or other qualified medical professional before beginning use of this or any other similar product. A thirty dose bottle is available to purchase on Amazon.com for $25.48. Going back to the beginning of this review we pointed out that anyone taking on the ultimate pursuit of attaining the ultimate body comes with a laundry list of details that must not only be considered but dealt with and adhered to on a daily basis. From choosing the right training methods to making sure that their recovery activity is allowing for maximum gains to a dietary plan that delivers the fuel that they need there is no room for error or complacency. When it comes to bodybuilding supplements the most serious athletes face an equally tough problem in trying to determine which of the vast array of options on the market can best deliver the benefits to them. Whether it's getting the proper elements necessary for the highest levels of energy and endurance, to reduce soreness and maximize recovery benefits, to burn fat at the most efficient rate and the greatest formulation of essential amino acids making the right choice in supplements can have a profound effect on their overall results. When comes to AminoLast specifically, there are a few critical areas that one must examine in order to understand whether or not this is the product to choose. The first of these is that the ingredients a generally accepted as being able to deliver on the products' promises and are in wide use among many of the top performing supplements put on the market by its competitors. Another critical area is in analyzing the formula that is used to create AminoLast. The information provided on the bottle is comparable to these types of disclosures made by its competitors but the product and the company fall far short in comparison to many top ranked brands in that it does not readily provide potential consumers and reviews with information regarding clinical research, studies or trials that would support the claims made for AminoLast. Taking these points and combining them with the very important fact that the vast majority of independent user reviews had a very low opinion of the benefits derived from taking AminoLast there is little doubt that AminoLast, at least as it is currently constituted, does not display the traits needed to place it among the top performing bodybuilding supplements available today.